About one month ago we launched the App Center to users in the United States, and it has already driven millions of installs to mobile, canvas and web apps. Approximately 80% of our monthly active users are outside the U.S. and Canada, so we’re starting to make the App Center more available globally. Today we’re turning on the App Center in seven additional countries, and we’re launching a new localization tool for developers. The App Center is now available to 100% of users in the United States, Australia, Canada, India, Ireland, New Zealand, South Africa, and the United Kingdom. 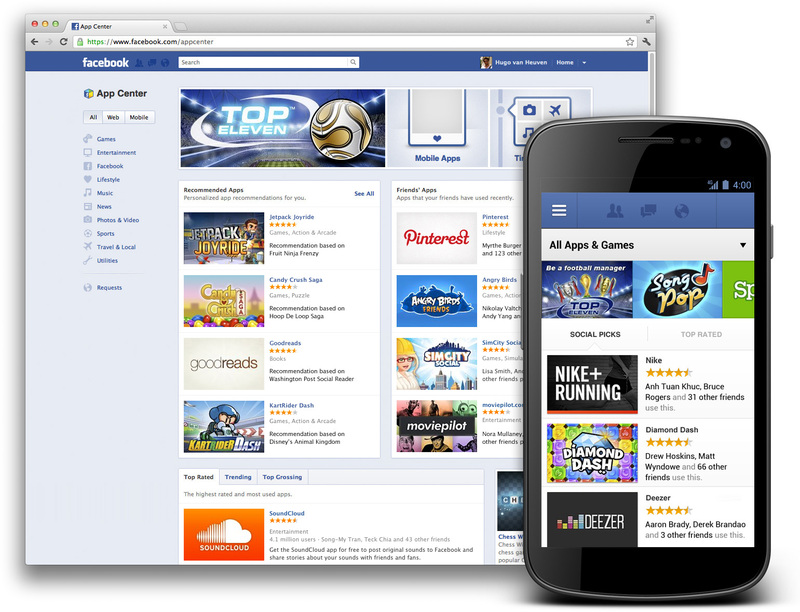 People in these countries will see the App Center bookmark in the left navigation menu on Facebook.com and in our iOS and Android apps. In the coming weeks, we are launching the App Center to users in Brazil, France, Germany, Russia, Spain, Taiwan, and Turkey. To have your app included when we launch in those next markets, please submit translated app detail pages as soon as possible. We are reviewing all high-quality apps and will prioritize those that submit translations by Friday, July 13, 2012. The App Center lists high-quality apps based on user feedback and orders them based on what a person is most likely to enjoy and the popularity in their country. Whenever possible, we show app information in a person’s own language. For example, if an app specifies English as their primary language but also provides translations for Spanish, we show the translated version to Spanish speakers and the English version to everyone else. To prepare for the broader rollout, we’ve added the Localize tab to the App Dashboard. 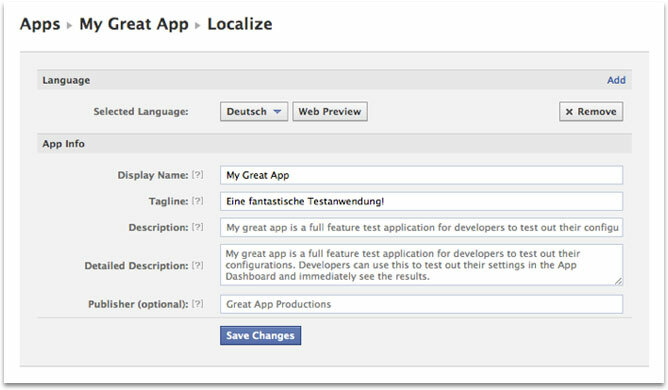 There, you can provide translations of your app’s information (name, tagline, and descriptions) for use in the App Center and across Facebook. Select a primary language. The primary language that you select on the App Center tab will be what people see if you haven’t translated your app detail page into their language. Choose additional languages. Go to the Localize tab, select “Add Language” from the language drop down, and click the language you wish to add. Provide translated content. On the next page, add a tagline, description and detailed description. If you are requesting extended permissions and have entered an explanation for this in your primary language, it will also be required for each additional language. Display name and publisher are optional. Save and submit. Once you’re done, click “Save” and then “Submit.” Translated content will be reviewed before an app is listed in an App Center category to ensure that it meets the guidelines. Even if you haven’t translated your actual app, your app information may appear to people that speak other languages on Facebook. For that reason, we recommend translating your app information into the languages most frequently spoken by your users (listed on the Users tab in Insights). For more information, please see the documentation. We’re excited to bring the App Center to millions more people and help them find social apps that work on the web and mobile. Please submit your translations by Friday, July 13, 2012 for prioritized review and to be included in the upcoming App Center launches.